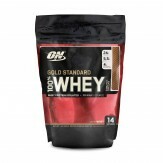 Whey protein is a mixture of proteins which is isolated from whey. Whey is the liquid part of milk that which is separates during cheese production.Approximately 20% of the protein in cows’ milk is whey. Convenient way of taking whey protein is to add 25-50 grams of protein on top of your daily intake. This can be important and useful for bodybuilders and gym enthusiasts, as well as people who need to lose weight or are simply lacking protein in their diet. Most flavored whey proteins are also pretty delicious and can be used to make healthy recipes (like smoothies) taste incredibly good.